$45.00 Out of stock. Email me when new stock arrives. Imagine this: you ask everyone in the audience to write down their favorite song (or first kiss, or three-digit number, or whatever you want) on a slip of paper and drop it into the cardboard box at the foot of the stage. The box never goes out of sight and (truly) nobody touches it. 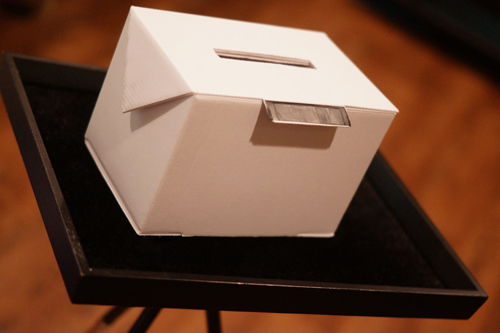 During your show, you invite a spectator to approach the box and open it, then reach inside and remove any slip at random. In the act of opening the box, the spectator unknowingly switches all the audience's papers for an entirely different batch of slips you prepared in advance. Use this to force a favorite song or number or celebrity name. THEN, you can use the information written by the spectators later on in the show. Mentalists will immediately identify the many, many opportunities this little box affords. It's as light as air, can be decorated or repurposed in any way you like, and is quite possibly the only effect we've produced that is easier than easy. The spectator switches the papers. You don't even touch the box.